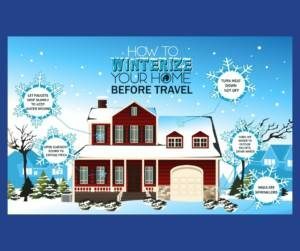 You’ve booked your flight, packed your bags, and set your security alarm on your home, but neglecting to do some simple winterizing of your home can make for a bad ending to your winter get-away. As important as it is to cancel your newspaper and take your pets to the kennel, it’s equally important to take these preventative steps to winterize your home before an extended absence. Perhaps the most important thing to do before you leave home for an extended stay is to remove water which can freeze within pipes and other areas. A burst pipe caused by frozen water can cause costly damage in your home – not something you want to deal with when you return home. Turn off the water to outside faucets, remove hoses, and drain the pipes. Open cabinet doors to expose pipes to your home’s warmer temperatures. Let your kitchen and bathroom faucets drip slowly to keep water moving. Stagnant water can freeze. Make sure your water lines or sprinkler piping is properly insulated. Turn your heat down, not off. Although it is tempting to dial it way back, keep your heat set to a minimum of 60 degrees while you’re away. Close the main water valve or supply to your home. This valve is usually located in the basement or laundry room of your home. After the main valve has been securely turned off, open (or turn on) all inside faucets – kitchen sink, bathroom sinks, tubs, showers and laundry room basin – and all outside faucets. Also, be sure to remove garden hoses from the outside spigots. The purpose of opening all faucets is to drain all of the water from the pipelines within and outside of the home. Turn off the heat source to the furnace/boiler and water heater. If the water heater is electric or oil, turn off the power at the switch. If the water heater is gas, you must turn off the gas valve. In most cases you can turn off the furnace by switching off the electrical power supply. Drain the water heater. Connect a hose to the drain at the bottom of the heater and allow the water to run into the floor drain. If you do not have a floor drain, extend the hose to the outside of the house or establish a line to a nearby laundry tub to remove the drained water from the heater. Once the heater has been drained, be sure you close the valve at the base of the heater. If you own an electric hot water heater, special precautions must be used in draining and filling an electric hot water heater. Electricity must be turned off before draining or refilling the water tank. It is advisable that a fire sprinkler system is winterized by a professional. Turn off the valve above the sprinkler connection so that the sprinkler system remains active. Keep the heat in the home turned on. Even if you are staying home this winter, you can take precautions to make sure your home is ready for the freezing temperatures. You can find those tips here. Our Len The Plumber professionals can take the guesswork out of prepping your home for winter. Give us a call to winterize your home for you with the use of heat tape and antifreeze solution in the pipes. Our experts are here to serve you with Same Day Service, 7 days a week and there’s never an extra cost for weekend or holiday service — so your holiday won’t cost you extra!